Join this amazing holiday and immerse yourself in the wine culture of France’s legendary Bordeaux region. Bordeaux is the oldest wine region in France and a premier destination for those who appreciate the worlds finest wines. Enjoy some of the most acclaimed chateaux in the area, boutiques, and family owned wineries while treating yourself with delicious food, fine wines, and the rich culture of Bordeaux! The boutique hotel is located in the heart of Bordeaux, in an 18th century building which has been restored in a manner that combines the chic and authentic original with the contemporary conveniences of today. Your individual quarters provide the ideal ambiance for relaxing after a day in the vineyards. The rooms have a Nespresso machine for your morning beverage, an electric jug, bottled water, a selection of Hermes toiletries, a luxurious bath robe, a hairdryer, a television, a safe, and free Wi-Fi. You can enjoy your breakfast on the shaded terrace in the hotel’s courtyard and for your pleasure, there is a wine bar in the hotel with an impressive selection of Bordeaux wines. The bar is tended by a passionate sommelier who will answer any wine-related questions and recommend you the right wine for the moment. During this wine tour, you will enjoy life as the locals do around the countryside and accompanied by some really knowledgeable companion like an expert in all things in Bordeaux and most specifically, in the wines. You will enter into many of the behind-the-scenes sites to which few but the locals are privy. You will feast on a lunch prepared by one of Bordeaux’s top chefs, linger over a cozy French dinner at a local bistro, and explore France’s oldest wine regions in the beautiful countryside like the famous Rue de Chateaux, ornate gardens, and other quaint villages while tasting delicious wines and spending time getting to know the region in a way no other tour can offer. Upon your arrival in Bordeaux, you will check into your exquisite accommodations, unpack, and relax for a bit. Later in the afternoon, you will gather with the group to enjoy a Bordeaux wine orientation and tasting. You will have an opportunity to meet the fellow travelers in the group as you sample six different wine styles, from Bordeaux’s dry white and sweet wines, to the mellow reds. The discussion and tasting will serve as an introduction to the various regions and the wines they produce. The wine tasting will be complemented by local charcuterie and cheese and the relaxed evening will also include a dinner at a local bistro in the city of Bordeaux. In the morning, you will leave the accommodation to enjoy a tour of Médoc. This trip will take you along the famed Route des Chateau. This unassuming highway on the Médoc peninsula is hemmed in by row upon row of legendary vineyards as far as the eye can see. Such famous names as Margaux, Latour, Léoville Barton, Palmer, Lafite Rothschild, Pichon Longueville, and Cos d’Estournel appear on signposts along the highway. As you make your way along the 50-mile stretch of motor way, you will take note of the changing terrain and how it relates to the wines produced from the vineyards. The first stop along the Route des Chateau is a prestigious second growth chateau in Margaux. Be prepared to delight your palate with two vintages of the silkiest and most feminine of wines. Just before noon, you will visit a top classified property in Saint Julien. You will take in breathtaking views while enjoying the lovely gardens which date back to 1815. Some of the bottles on the property also date back from over 200 years. You will sample three old vintage wines in this visit. After the wine tastings, you will make your way to a small classified chateau near Saint Julien where you will enjoy a lunch overlooking the prestigious vineyards of Saint Julie in such a warm and welcoming atmosphere. After lunch, you will be treated to a visit to the only bio-dynamic chateau in Pauillac. Bio-dynamic agriculture preceded today’s organic movement but utilizes the same methods such as utilizing animals and plants to take the place of processed fertilizers and chemical pest control. You will stroll the vineyards and witness for yourself how these natural applications utilized for the past 15 years have affected the wine production. You will taste the difference of an older vintage wine and a barrel sample from a newer vintage. The trip along the Route des Chateau would not be complete without a visit to Mademoiselle de Margaux, a world famous chocolate maker. Upon returning to your accommodations, you will have a free evening to enjoy as you please. During the morning, you will depart for a visit to Saint Emilion. The first stop will be at a grand "cru Classé" in Saint Emilion. This property is located on the impressive limestone plateau of Saint Emilion. Deep beneath the vines you can find underground caves filled with bottles of what some consider to be the very best Bordeaux wines. You will taste three of these exquisite wines including an older vintage 2001. After the wine tasting, you will be on your way to visit one of the oldest properties in Bordeaux. This family owned property is still making wine after 14 generations of vintners from the same family. Rare tulips and orchids dating back to Roman times can be found blooming naturally among the vines. You will surely be transported back in time when you look out upon the ancient grounds. A rare bottle of wine was found under the floor of the family’s private cellar that dates back to 1750. You will be privy to a vertical tasting of four vintages of wine. You will tour the inside of a grand chateau. This is a rare opportunity to see inside a private residence resplendent in every detail and decorated with antiques dating back centuries. After the tour of the storied estate, you will enjoy a lunch created especially for you by a private chef and the lunch will be served in a charming chateau that overlooks a stunning garden. The chef is noted for creating meals alongside such world-renowned Michelin-star chefs as Alain Dutournier and Bernard Loiseau. Using local and wholesome, farm-to-table ingredients, some from the property’s own organic garden, the chef is certain to dazzle and impress you with a memorable meal. The wines served during the meal will pair and complement each course. After the lunch, you will partake in a comparative tasting of three outstanding wines from a top Saint Emilion classified vineyard. The terrain of Saint Emilion influences the taste of these spectacular wines. The terrain of the region, including the limestone plateaus of Saint Emilion and Lalande Pomerol, make quite a difference in these wines as you will most certainly find out during the tasting. You will also visit the UNESCO world heritage medieval village of Saint Emilion. This historic village was founded in the 8th century by Benedictine Monk Emilian. You will visit the shops of St. Emilion and perhaps you may enjoy a stop by a macaron maker’s petite atelier for some lovely treats. Upon returning to your accommodations, you will have a free evening to enjoy as you please. On this day, you will visit the Sauternes Appellation, which is composed of five tiny and picturesque villages in Graves. This unassuming region is known worldwide for its magical sweet wines. Although there are often impressive contenders for this title-late-harvest Riesling, Port, and some very fine Alsatian varieties, Sauternes liquid gold remains unsurpassed. The trip will take you to Graves and Sauternes where you will visit top classified producers of both, red and white wine in Graves and Pessac Leognan. The owners will welcome you at their private family Château in the Graves region where you will enjoy a delicious lunch. The meal of steak or duck breast will be cooked in the traditional "rotisserie" way on vine cuttings which impart a unique and delicate flavor. They produce a range of lovely wines like a dry white wine, which may be at the point of harvest, a soft red, and an out-of-the-ordinary rare cerons, sweet and quite appealing. 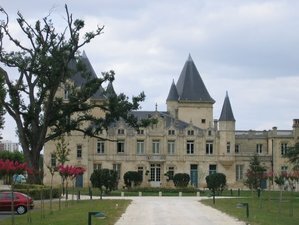 You will then travel to Sauternes, where you will enjoy a tour of a unique and classified chateau that remains family owned. You will sample a range of the excellent vintages as a special treat and then, you will be off to another small Sauternes family winery where you will be greeted by the owners. You will enjoy a tasting of a range of their superb Sauternes wines that come from grapes grown on plots adjacent to the top Yquem and outstanding Climens vineyards. Later, you will visit a foie gras shop in Langon. During the evening, you will take part in a cooking class where you will create a meal using the typical ingredients and fresh produce from the Bordeaux region. During the morning, you will set off for a visit to a Médoc Cooperage or wine barrel maker. The sojourn will take you to a cooperage which boasts five generations of coopers and after an enlightening and interesting look at how the coopering process evolves, you will venture to a Margaux chateau. Right after, you will be off to the coastal Cap Ferret to enjoy a lunch at an oyster farm right on the Atlantic coast where you will share another Bordelaise dinner in the evening. On your last day, you will say goodbye to the beautiful Bordeaux. However, you will depart having learned and truly experienced immersion in one of the most notable wine regions in the world. This holiday will take place at an elegant boutique hotel in Bordeaux, France. Bordeaux is recognized for its exquisite red wines and many of the most celebrated and coveted Merlots and Cabernet Sauvignons come from there. The variance of growing condition, the diverse soils, the micro-climates, and the gifted wine growers have the ability to blend several varieties of grapes and contribute to the elegance and diversity of the wines of Bordeaux. During this culinary tour, you will be served one daily breakfasts buffet style, four lunches at different locations, some prepared by one of Bordeaux’s top chefs, and three dinners at a local and cozy bistro in the city. During your free time, you may explore the location on your own or simply relax at the venue. Please book your flight to arrive at Bordeaux–Mérignac Airport (BOD). For more information, please send Food N' Wine Vacations an inquiry. Food N' Wine Vacations is a tour designer company. They specialize in culinary vacations and wine tours in Italy, France, Portugal, and Spain.